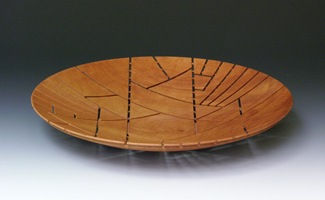 Craft Arts International, issue # 82 features an article on me, written by Kevin Wallace, entitled " Pattern, Processes, Precision - Work in Wood by Harvey Fein. What follows is the article. I have added some photos to help put them all into context. Harvey Fein is an artist in love with the mechanics of things, with the line between inventor and artist blurred by his process. He holds four patents and has designed numerous machines and projects. Ideas come to him as fully completed objects and are reverse engineered to become manifest. His father was in the business of making window curtains, and the sound of the factory - sewing machines, steam irons and table saws – plays in the background of his subconscious as he creates machinery and art. The contemporary craft movement that emerged in the second half of the 20th century was inspired largely by the Arts & Crafts Movement, which had created a romantic and idealistic view of the craftsperson, in opposition to the “soulless” machine-made production of the Industrial Revolution. The movement was influenced by the social criticism of John Ruskin, who believed the machine was at the root of many social ills. The lathe - a machine closely tied to industry - showed little promise as a means of self-expression in this revolution. In March of 1901, a year after the death of John Ruskin, Frank Lloyd Wright presented a lecture to the Chicago Arts and Crafts Society. Titled, The Art and Craft of the Machine, Wright’s address asked his fellow artists to consider the good that technology could bring to their creative endeavors. Wright disagreed with the idea that the machine was foreign to the creative process, arguing that technology would prove vital to progress in the arts by opening new avenues of self-expression. A century after Wright shared these thoughts, Harvey Fein began creating works in wood, with a love and fascination for all manner of machines central to their inspiration and creation. That first work began with an idea and the challenges it presented. Since then, each of Fein’s works has been a stepping off place for the next – new forms, new combinations of material, new patterns and the challenges they have entailed. 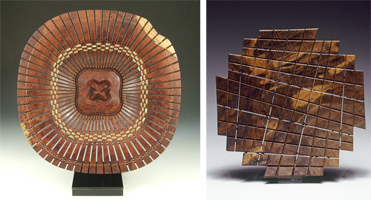 As the woods employed by Fein must be bone-dry and tight-grained, he tends to work with kiln-dried tropical hardwoods: “I choose a wood with surface features that I think will complement the design and then rough out the shape I need — usually a large, shallow platter about one-inch thick. Sometimes I draw parts of the design on the surface of the wood to determine placement, especially if there are prominent surface features that present design or structural challenges. “I need to know how things work,” Fein says of his inspiration. “While in college, I earned spending money as a mechanist and used to imagine that when I retired I'd work in a machine shop again for fun. 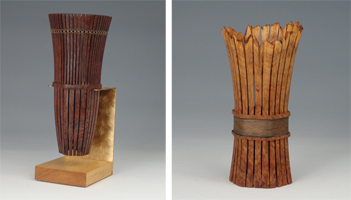 As he moved away from imitating the artists and teachers he encountered in person, on the page, and on video, Fein saw that his creativity and skills as a machinist and a maker were showing up in his work. 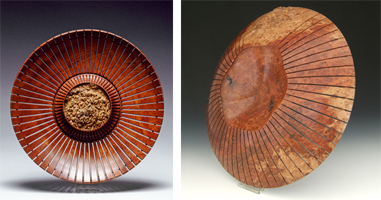 Early in his career as an artist, he used a router to cut straight grooves in the side of a bowl and created inlays to place in the grooves. While the technique was simple, it was the ideas that it sparked that excited him. He envisioned a whole realm of possibilities that would open up if he could just get more control of the movement of the router over the surface of the wood. Since that time, he has developed a system that includes a collection of forty pieces in steel and plastic, as well as threaded rods, gears, and coupling, of various shapes and sizes. Discussing his development as an artist, Fein says, “When I started out, I spent my time perfecting my craft. I then concentrated on form. In hindsight, as I developed my own style, I sort of gave up the craft portion of what I was doing to concentrate on the forms in my head, which is always bursting with ideas. Fein draws his inspiration from the patterns he finds all around him. He finds great beauty in the natural world ¾ a thin coating of ice on a lake will crunch up against a bulkhead, a bloom of forsythia flowers in Central Park, the details on a leaf in a lily pond, the designs found in the bark of lignum vitae, a ravine carved by streams, or moss on shale. In the man-made world he looks at everything from architecture to the patterns created by items on market shelves. Other artists taking part in the project include John Jordan, Binh Pho, J. Paul Fennell, Mike Lee, Dixie Biggs, Jacques Vesery, Andi Wolfe, Graeme Priddle. The iconic philosopher’s words, like Frank Lloyd Wright’s vision of the machine’s potential, make clear the precedence and potential of Harvey Fein’s explorations.